Some fields are mandatory to the generation process and must be filled before it occurs. The others are optional. Gallery Title: the title of your gallery. Input directory: the folder containing the photos composing the gallery. All these photos will be included, alphabetically sorted (but can be reordered). The supported file formats are JPEG and 24bit TIFF. 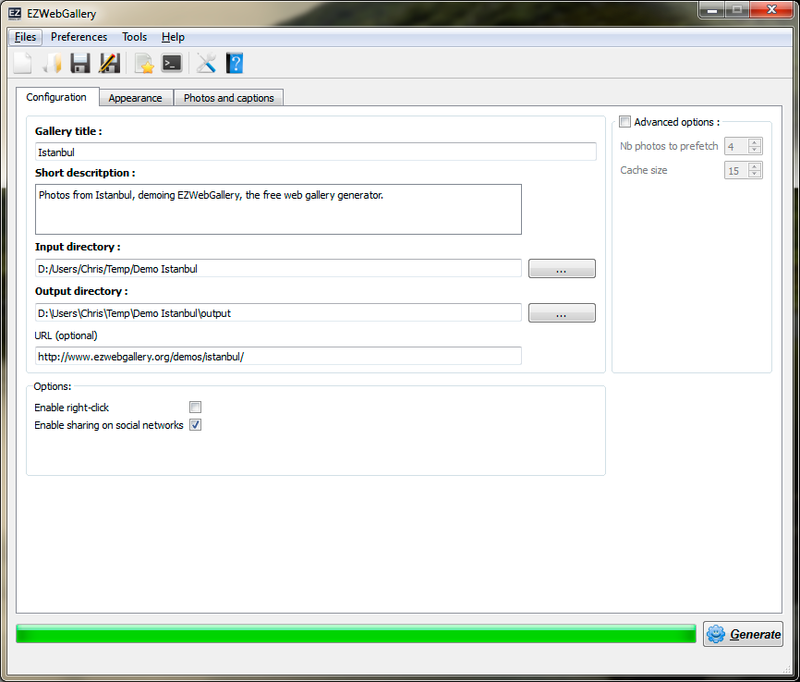 Output directory: the folder containing the generated gallery. All its file tree structure is to be uploaded on a web server. The entry point to the gallery is the file index.html. Short description: Allows to describe the content of the gallery. It is used by search engines and social networks, if sharing is allowed. URL: The future address of the gallery, once on-line. It is used by some social network, such as Facebook to display a thumbnail. Enable right-click: Enable right-clicking on the displayed photos, showing the corresponding contextual menu. Enable sharing on social networks: A tool-bar will be placed on the bottom-left corner of the Index screen, allowing the visitors to easily share the gallery on various social networks such as Facebook and Twitter. EZWebGallery uses a smart caching system in order to hide the network latencies and make the navigation through the gallery more fluid. When a photo is displayed, EZWebGallery prefetchs the following photos. All the displayed and prefetched photos stays in the cache until it is full, allowing to quickly navigating backward. When the cache is full, the oldest photos can be discarded when the prefetcher claims space. Nb photos to prefetch: is the number of photos which will be loaded in advance. A too high number may stress the network connection between your server and the visitor, without enhancing the fluidity that much. Cache size: capacity of the cache. The memory consumption when visiting the gallery is proportional to it. Is set too high, it can be problematic on some limited handled devices such as a smartphone.